« Forget the Financial Settlement. Why Aren't These Guys on Trial for Attempted Murder? so, if nature has a right to life, what do the bolivians plan to eat? > as been in the Northern Hemisphere and in fact in the upper portions of the Northern Hemisphere. What, you mean where there has been social infrastructure built up around the monitoring stations? Naw, that doesn't offer governments an excuse to encroach on private property rights more than they already have with civil planning committees. I know, we'll call it "Universal Temperature Change"... or something along those lines. We'll establish some bogus cause and then demand the power to control that cause despite trampling on private property rights! Yeah. Yeah, **that's** the ticket. "and the right to not have cellular structure modified or genetically altered"
So, ummm, are they planning on enjoining the Sun, the Universe and all nature of virii and bacteria against their gene modifying ways? It's a new moral discovery. There ought to be a journal so you can keep up. Will Mother Nature go to jail in Bolivia if she causes a natural disaster? Jeez guys, get real, it's just another lefty political stunt designed to fool the local citizens, and it will probably work. And I say good for Evo Morales. It is immoral to let a sucker keep his money. So long as the common man votes for socialism he should be given socialism, good and hard. 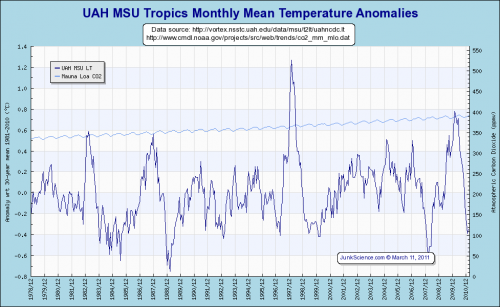 Most of the warming the Earth has seen over the last 50 years (whatever the cause) has been in the Northern Hemisphere and in fact in the upper portions of the Northern Hemisphere. Here are the temps for the tropics. 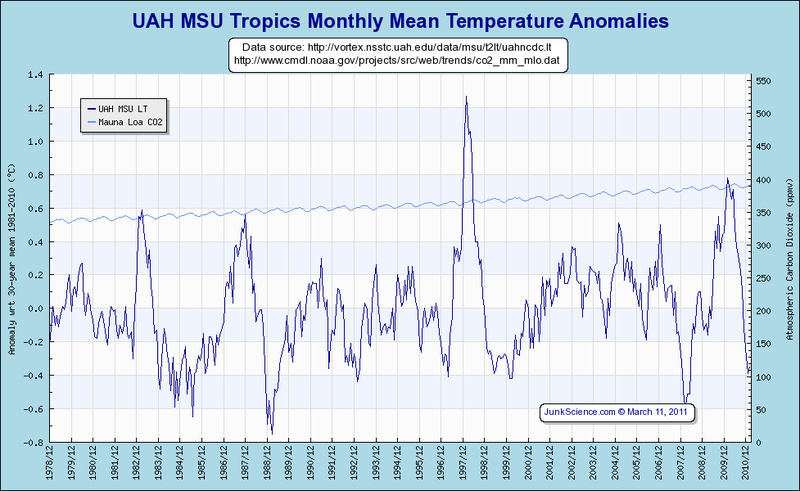 The spikes in 1998 and 2010 are El Ninos years.